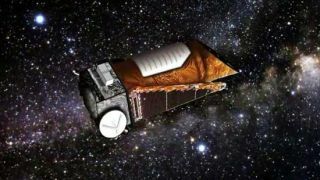 Whether or not NASA's Kepler spacecraft can bounce back from the malfunction that has stalled its search for alien planets, the mission's place in history is assured, scientists say. Kepler has spotted more than 2,700 potential exoplanets to date, with many more waiting to be plucked from the mission's huge dataset. Its discoveries have opened the eyes of scientists and the public alike, revealing that the Milky Way galaxy abounds with an incredible diversity of alien worlds. "Before we flew Kepler, we didn't know that Earth-sized planets in habitable zones were common throughout our galaxy," Hertz added. "We didn't know that virtually every star in the sky had planets around them. Now we know that." The Kepler spacecraft launched in March 2009, kicking off a 3.5-year prime mission to determine how common Earth-like planets are throughout the galaxy. The observatory spots alien worlds by detecting the tiny brightness dips caused when they pass in front of their parent stars from the instrument's perspective. To stay locked onto its 150,000-plus target stars, Kepler needs three functioning reaction wheels, gyroscope-like devices that allow the spacecraft to maintain its position in space. Kepler has four such wheels. But one, known as No. 2, failed in July 2012. And No. 4 has now failed as well, NASA officials announced Wednesday. Mission engineers will try to bring the two failed wheels back into service over the coming weeks. If they cannot recover at least one wheel, Kepler's planet-hunting days are almost certainly over, though the observatory may get a new mission that doesn't require incredibly precise pointing. Mapping out a new mission would likely take months, Hertz said. "It's a technical study that the project needs to do to identify what the options are," he said. "And then we would have to do a scientific study to determine what the benefits of those options might be." While just 132 of Kepler's 2,700 exoplanet candidates have been confirmed to date, mission scientists expect that more than 90 percent will turn out to be the real deal. And the team has had time to go through just half of the spacecraft's dataset thus far, team members said. "We have excellent data for an additional two years," said Kepler principal investigator Bill Borucki, of NASA's Ames Research Center in Moffett Field, Calif. "So I think the most interesting, exciting discoveries are coming in the next two years." One such find might be the first true "alien Earth," a potentially life-supporting planet the size of our own. Kepler has already spotted several possibly habitable worlds, including the recently announced Kepler-62e and Kepler-62f, but all of them are slightly larger than Earth. Future discoveries will be icing on the cake, experts say. Kepler has already revolutionized exoplanet science, giving researchers an unprecedented systematic look at worlds beyond our solar system. For example, astronomers recently used Kepler data to estimate that 6 percent of the galaxy's 75 billion red dwarfs — stars smaller and dimmer than the sun — likely host habitable, roughly Earth-size planets. That works out to a minimum of 4.5 billion alien Earths, the closest of which may be just 13 light-years away, according to the study. Kepler observations have further revealed that small, rocky worlds like our own are much more common throughout the Milky Way than gas giants such as Saturn or Jupiter, at least in relatively close-in orbits. "It really goes back to, at least for me personally, sitting on my rooftop watching the stars, thinking about what's out there," said NASA science chief John Grunsfeld, a former space shuttle astronaut. "And now we know, because of Kepler and the hard work of all the Kepler scientists."